Never, ever, insult your users. Unless your web site revolves around insults, and every error message consists of a purposefully engineered insult for humorous reasons, treating your users with disdain or disrespect is a huge no-no. First, I clicked Submit Link, and was presented with an option to register. I’m personally not a huge fan of CAPTCHAs, for many reasons (there are alternatives, but there’s no panacea), but I do empathise with why people put them in place. Unlike someone who has poor eyesight, I can usually read the letters, and it’s usually only once that I need to type them in, so we’ll let that slide for now. And at least the letters in reddit’s CAPTCHA are relatively easy to decipher compared with others that I’ve seen in use … right? Apparently those letters weren’t as easy to decipher as I thought! Here’s the clincher though — not only was my attempt at passing the CAPTCHA unsuccessful, but I was insulted for my trouble! Once I’d managed to endure a second CAPTCHA and finally registered, I thought that would be the end of it. But no! 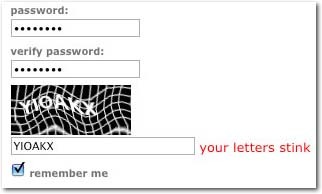 I was immediately presented with another CAPTCHA that I needed to pass in order to actually submit a link. Hooray, so I passed the CAPTCHA. But wait — I’ve been presented with another hurdle! This infuriated me. Too fast? What does that mean? This was the first link I’d ever submitted. Was I meant to type more slowly or something? I’m assuming this is a bug, and should only be presented if a user tries to submit too many links in a given period (which I didn’t). But that aside, even if this had been my second link, why should I be prevented from submitting something within a certain period if I’ve already proven I’m human? Thoroughly peeved, I went off to lunch and left the submission page in my browser, to tackle when I got back. If I could be bothered. Back from lunch, and I’ve tried again — only to receive more insults for my trouble (note the CAPTCHA image changed after it rejected my attempt, hence the discrepancy below). Argh! Apparently I still can’t read (cos you know, it’s clearly my fault … honestly, can anyone tell me what I’m missing with these damn CAPTCHAs?). At this point, I decided to pack up and leave. I’d experienced enough friction (and been insulted and falsely accused too many times) to decide that reddit was not worth my trouble. Am I being too harsh? Is it reasonable to pick on one site when no doubt there are plenty of usability issues that need addressing with our own site? (although we certainly don’t insult any of our customers!) Should I have approached reddit privately first before posting in a public forum about it? Maybe. I figured they’re big enough that they can probably take it. To be honest, though, I’m more interested in hearing your horror stories with signup processes and CAPTCHAs … does it get any worse?